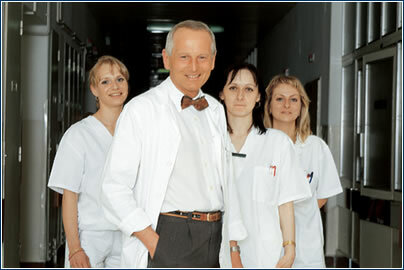 The head of the Cardiology Center of the Prague Institute of Clinical and Experimental Medicine (IKEM) is a renowned surgeon. This energetic chief of six hundred subordinates knows how to accept criticism, but won’t tolerate slander or sloth. You’re an experienced surgeon who operates every day. You also head up 600 people. Can two such demanding activities be combined at all? I enjoy operating immensely, but I like leading, too. I think doing both is beneficial. The chief of cardiac surgery should be a person with practice in the field so he can advise younger colleagues in cases where they don’t know what to do. How would you describe the ideal chief? A good chief is open to new things and is always learning. But I’m not talking about management handbooks. Every person is different and acts according to his nature. If a manager acts according to some manual, it’s evident that his approach isn’t his own and his subordinates won’t have faith in him. It’s essential for a chief to take charge of the overall course of the enterprise and not be afraid to delegate authority. And he should be able to motivate his employees and himself. What management method has proven itself for you? I try to respect individuality. Cardiosurgery is a complex mechanism that must click faultlessly, because even a small mistake can be fatal. I can’t hire nothing but stars, I also need people who don’t aspire to becoming chiefs yet do their work reliably. I’m aware that everyone is effective in different ways and areas. No one shouts in our operating room, no one throws scalpels. That kind of nervous or intimidating behavior from a chief detrimentally affects all those around him. Do you have any shortcomings connected with management? My shortcoming is my hectic activity. Impatience. I’m pretty hard to put up with in that respect, which may be why I can drive people to great performance. We have the largest cardiology center in the country and perform 1,500 operations a year. What criteria are decisive when you add members to your team? 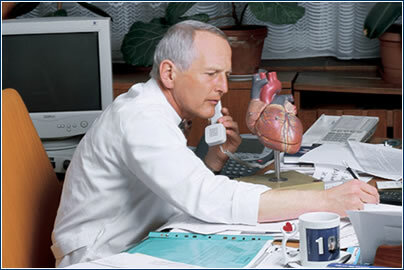 For me, the ideal employee is someone who’s avid about cardiosurgery. Additionally, he or she must be careful and conscientious. Disloyal people who spread slander bother me terribly. What’s your stance on conflicts? We always have a formidable work load, and sometimes patience wears thin and revolts break out in some group or another. Solution? We agree on financial rewards. Ever since the Phoenicians invented money it’s been the best acknowledgment for work done as well as the best motivation for work ahead. But I’m not saying that people don’t want their attitudes evaluated. Praise and financial rewards should go hand in hand. Do you get together with your subordinates outside of work? I try to reinforce team spirit by organizing an employees’ party at a pub twice a year. A few times after they’ve had a bit to drink they’ve confided in me with matters that they otherwise wouldn’t have. On the contrary. I don’t like it at all when someone pats me on the back and says I’m doing everything well. I need them to tell me what I’m doing wrong. I don’t take offense; criticism helps people improve. Stressful situations can arise during any operation, but the chief mustn’t ever lose his head and start fussing. Another thing is when you get stressed out over something you can’t influence. For instance, we average six cardiosurgical procedures a day. But sometimes there are complications and we aren’t ready to operate on someone who’s ready for surgery so we have to postpone the procedure. This is the greatest stress for me, because I know how many examinations a patient has to go through and the psychological situation he or she is in. Long-term stress has to have an effect. How do you work it off? What managerial mistake have you made, and how did you learn from it? I think the biggest nuisance in the workplace is so-called communication static. And I’ve fallen prey to it – once a station nurse told me a certain doctor had done something bad. I bawled him out but good before hearing him out. Then he told me it had been completely otherwise. Lesson? In a conflict you have to listen to both sides before coming to a conclusion. Reknown surgeon Professor Pavel Pafko is opposed to equality in the operating room. He says women don’t belong in surgery, as it’s physically demanding and takes lots of time. Do you share his opinion? Not at all. My dream is to train a female cardiosurgeon, even though I’m aware that operations are lengthy and physically demanding. Cardiosurgery isn’t an eight-hour-a-day job, so women with families may be at a disadvantage. Why exactly did you pick cardiosurgery for your life mission? When I was young I wanted to be a sailor, but once you’re addicted to surgery you can’t stop. The feeling you get when a patient comes to you at death’s door and goes home healthy can’t be matched by anything.